The two endangered snow leopard cubs are one month old today, and we took some new photos this morning to document their growth. Check out the full photo album from this morning's session on Woodland Park Zoo's Facebook fan page. Become our Facebook fan to get automatic zoo updates in your Facebook news feeds. The two cubs remain behind the scenes with their mother while they bond and grow, but stay tuned to the blog for more updates on the duo. Woodland Park Zoo’s first ever tawny frogmouth chick is growing up! What first looked like a cottonball is now starting to look more like the adults of its species. At 20 days of age, the chick is doing great and achieving all the expected developmental benchmarks—it has clear eyes, its flight feathers are growing well and its weight is up to 5.9 ounces (it would take six stamps to mail it!). The first-time parents are doing well too. The male, shown here, has been sitting on the nest during the day brooding the chick. The chick has been given the name Nangkita, an aboriginal word inspired by its native Australia meaning “place of little frogs.” It’s a fitting name given the bird’s wide, frog-like mouth. 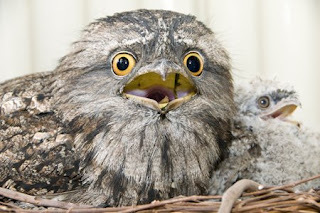 Typically tawny frogmouth chicks leave the nest between anywhere from 25-35 days of age. 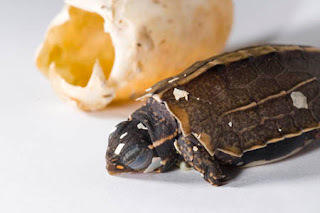 Meet a newly hatched, endangered black-breasted leaf turtle. When this turtle was born on June 5, it weighed in at 5 grams—about the weight of a quarter—and its shell is about the size of a quarter too! 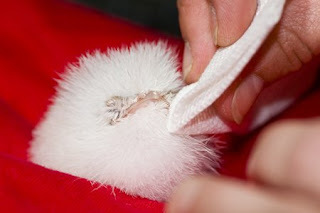 A lot of care goes into preparing for a hatching like this. It took about 2 months to gestate in our incubator which was set at about 78-80 degrees Fahrenheit. One of the most striking and conspicuous features of this unusual turtle is its large and protuberant eyes that give an alert expression. Their diet includes snails, slugs, earthworms and other forest floor invertebrates, although some captive individuals apparently also feed on fruit and vegetables. 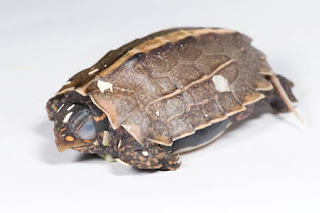 Like most Asian turtle species, the black-breasted leaf turtle is in grave danger of extinction due to over-collection from the wild for the food, medicine and pet trade. Turtles are highly prized in some cultures for food and traditional medicinal purposes. The two recently hatched turtles will likely not be on display for some time, but their parents can be seen in the Day Exhibit. I love animals, and I know you do, too. Although I'm only 3 years old, I want to help Woodland Park Zoo help people learn how to save animals and the habitats they need for their homes. 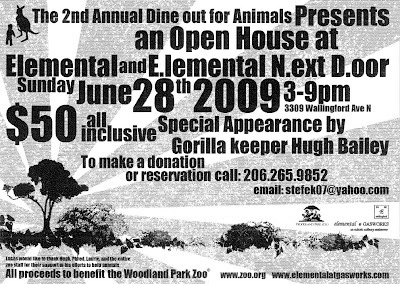 So please come to my second annual Dine Out for Animals fundraising dinner at Elemental, next Sunday June 28 from 3:00 p.m. - 9:00 p.m. All proceeds will help the zoo care for its amazing primates--including my friends, the gorillas. Lucas's love of gorillas inspired him to host the first annual Dine Out for Animals last year, where money raised went to support the creation of a new "jungle gym" for our gorillas. 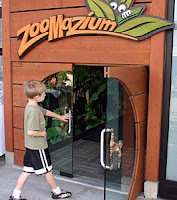 Now Lucas is ready to expand his project to support other primates at Woodland Park Zoo, and he is hosting the second annual Dine Out for Animals--recently featured in The Seattle Times--to raise additional funds. His love of animals and spirit of giving is an inspiration to us all! We hope to see you there in support of Lucas and Woodland Park Zoo! Photo: Lucas enjoys a meal with animal friends. Photo by Engles-Klann family. 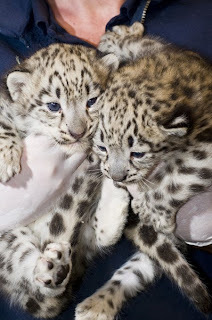 Check out this video filmed today with zookeepers Deanna Ramirez and Pat Owen weighing and checking the male and female snow leopard cubs born at the zoo on May 25, 2009. Turn the volume up to hear the sound of the cubs! The cubs are growing at a steady rate and their mother is continuing to provide great care. Right now mom and cubs are behind the scenes in a quiet area where they can bond and develop with minimal disturbance. This birth, part of the Species Survival Plan for this endangered species, is an important step for snow leopard conservation helping to increase genetic diversity. Woodland Park Zoo also helps protect snow leopards in the wild through our work with The Snow Leopard Trust, a Woodland Park Zoo Partner for Wildlife. Spots of beauty: endangered snow leopard cubs born! Woodland Park Zoo celebrated a significant achievement on Memorial Day: the birth of snow leopard cubs, a male and a female! We had a chance to take some photos today when zoo veterinarians performed a neonatal examination on the cubs as part of the excellent animal and medical care program at the zoo. They’ve been given a clean bill of health! Dr. Kelly Helmick, Associate Veterinarian, told us that the cubs are healthy and the maternal care appears to be very good. The male weighed in at 4 lbs and the female at 3.6 lbs today. The 3-week-old cubs represent the first offspring for both the 4-year-old mother, Helen, and 3-year-old father, Tom. This is an important achievement for conservation as well—the cubs’ birth is part of our work with the Association of Zoos & Aquariums’ Species Survival Plan to bolster the genetic diversity of this endangered species. Woodland Park Zoo participates in 39 Species Survival Plans, which also involve collaborative conservation activities such as research, public education, reintroduction and field projects. The first-time mom and cubs are off public exhibit to allow bonding and proper nursing. Snow leopard cubs are born helpless, with their eyes closed, and rely for several weeks on their mothers for nutrition. Since snow leopards are solitary animals in the wild, the father has been separated and is on public view with the zoo’s other adult female, Nadia, in the snow leopard exhibit adjacent to Australasia. Woodland Park Zoo has a long history of caring for and protecting snow leopard populations. The Seattle-based Snow Leopard Trust, created in 1981 by the late Woodland Park Zoo staff member Helen Freeman—the namesake of the mother of the cubs—is one of our Partners for Wildlife. We work together to save these magnificent cats and improve the lives of people who live in the snow leopard countries of Central Asia. 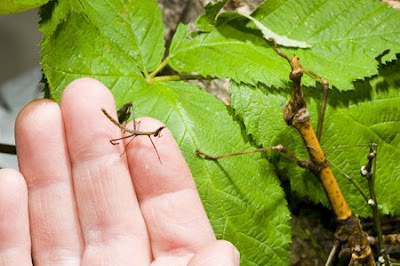 This amazing "stick bug" is actually a grasshopper species. This insect, native to the upper Amazon Basin of Peru and Ecuador, is a great example of sexual dimorphism, which in this case means the female and male look like different animals. The male is smaller and green with white "face" marking, and the female is several times the male’s size, tan-dark brown, and looks exactly like a stick! She even has markings that look like bud scars. The eggs of this species take nine months to a year to hatch, and the female oviposits them in the soil, burrowing her abdomen in the substrate all the way to her rear legs! Woodland Park Zoo has kept these animals since mid-2005, but has only recently displayed them, along with Peruvian fire stick insects, in Bug World. Come check them out! Come see dozens of these colorful and inventive penguin artworks unveiled this Friday, when Woodland Park Zoo and The Greenwood Collective launch our community art project—Penguins on the March. 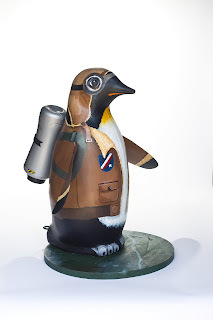 Sixty-two artists from across Seattle, ranging in ages 8 to 80, designed and decorated these 22” penguin statues that will migrate across Seattle neighborhoods this summer. But first, they’ll be unveiled at the base of the Space Needle on Friday, June 12 from 10 a.m. to noon, and later that evening at The Greenwood Collective during the Art Walk, from 6:00 – 9:00 p.m. Both events are free to the public, so come on by! Then the penguins will migrate to outdoor locations across Ballard, Fremont, Greenwood and Phinney Ridge throughout the summer, spreading art and wildlife awareness. And brightening your day! 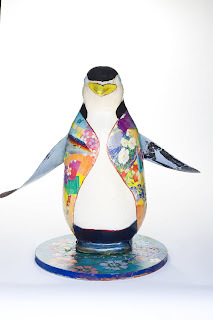 Inspired by Woodland Park Zoo’s all new Humboldt penguin exhibit, these colorful art ambassadors will later be auctioned off to raise funds for Woodland Park Zoo’s wildlife conservation programs, protecting endangered species and habitats in 50 countries around the world. 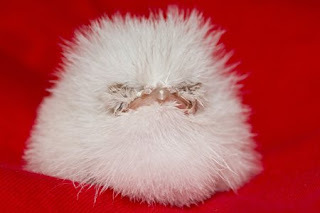 What looks like an oversized cottonball with a beak is actually Woodland Park Zoo's first ever Tawny frogmouth hatchling! Keepers had been artificially incubating the egg for about 25 days (shorter than the usual 28-30 day incubation period), and within an hour of hatching Thursday morning, returned it to the nest where the parents have now taken over care. The parents, who came to us earlier this year from the Taronga Zoo in Sydney, Australia, are very attentive and defensive of the chick so far. Based on the chick’s weight gain, they also seem to be doing a good job of feeding their new hatchling. Woodland Park Zoo is one of only four zoos to have successfully bred this species in the last six years. As Population Management Plan coordinator for this species across all Association of Zoos & Aquariums institutions, I can say that this hatching represents a very significant achievement for the North American zoo population. Native to Australia, the Tawny frogmouth is a nocturnal bird that preys on insects, mice, and other small terrestrial animals. Typically the male and female take turns feeding the chick until it is ready to leave the nest after approximately 25-35 days. Keepers are monitoring the parents and hatchling in an off-exhibit area to be sure it is feeding regularly. You can see an adult male Tawny frogmouth in the Night Exhibit located near the Rain Forest Food Pavilion. This past Saturday we celebrated the fourth Bear Affair, our annual event that provides tons of information about bear species around the world. The centerpiece of the event, and perhaps the most highly anticipated activity by zoo visitors (and maybe the bears!) is the non-safe campground demonstration. This entails recreating a human campsite within the brown bear exhibit in our Northern Trail zone. The campsite is complete, including a tent, barbeque equipment, clothing, sleeping bag and a cooler---basically all the equipment one would take along on a camping trip. The twist is that instead of storing food safely away from bears--in airtight bags 15 feet or more up in a tree, in bear safe containers--everything is left casually around the site. Julie Hopkins, a field coordinator from our conservation partner, the Grizzly Bear Outreach Project, narrated as the bears were let out to discover the bounty left strewn about. As the bears tore into the tent, bounced up and down on the food-stuffed cooler and generally caused campground havoc, tips were given on how to avoid this scenario on your campsite. In addition, the Washington Fish and Wildlife Department gave demonstrations at the Northern Trail of their new Karelian bear dog program. Using a trained Karelian bear dog, the breed originally from Finland, troublesome bears are found and then relocated to areas safely away from human sites. Thousands of people showed up for the day and also got to hear talks about gray wolves, and our other bear species at the zoo, sun bears and sloth bears. Zoo visitor Natalia Balodis of Washougal, W A, was lucky enough to be at the right spot at the right time. 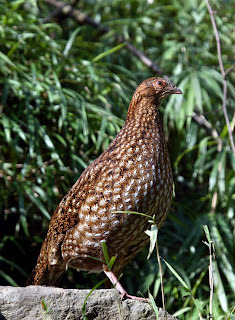 Prior to this short video taken in the walk-thru of the Conservation Aviary, the brown female Cabot’s tragopan (Tragopan caboti) was observed crouched low in the grass, pumping her wings (“wing whirring”); she was facing one of the large boulders in the center of the enclosure. The colorful male was on the other side of this boulder and began his frontal courtship display. This begins with the distending of his throat wattle until it hangs like a fleshy bib in front of his breast. Then he began pumping his wings up and down along the sides of his body. Bright blue fleshy “horns” emerged from the top of his head. As the wing flapping increased in speed, he stood as tall as possible and then charged around the boulder towards the female. This can be viewed in this 21 second clip. Cabot’s tragopans are endemic to south-east China where they inhabit subtropical, evergreen broadleaf forest and mixed deciduous-coniferous forests at 600-1800 meters. This species is listed as vulnerable because it has a small population (estimated at 9,300 from a 1995-2000 survey) which is severely fragmented and undergoing a continuing decline owing to the ongoing conversion of natural mixed forests to conifer plantations. You may remember the high-flying tale of Leonel, Woodland Park Zoo’s newest western lowland gorilla, from back when he arrived via Fed-Ex in the winter. We promised you an update, and, though Leonel is still behind the scenes, he has certainly been making strides toward adjusting to his new life at Woodland Park Zoo. Hugh Bailey, lead keeper for the gorilla unit says that Leonel has adapted "better than expected" to his new situation. "He had a lot to get used to," remarked Bailey, saying that Leo has become comfortable with a host of new sounds including the roar of nearby lions, and new people. Leo is also getting used to new gorillas in his life. Due to the nature of gorilla social dynamics, the keepers are proceeding slowly with introductions, beginning with visual introductions and seeing how this plays out before going to the next steps of physical introductions. "We really do this at their pace; they need time to get used to one another before they meet face-to-face." Bailey notes that Leonel's first sightings of "the girls," the female members of his new group, were pretty much the results that were expected. He displayed with a variety of typical male gorilla actions that are part of "showing you're a tough guy," according to Bailey. For now, the 341-pound gorilla and his potential female group mates continue to woo each other while keepers stage the next steps in his journey toward acceptance into his new family. Photo courtesy of Zoo de Granby, Leonel's former home.